Life is full of impediments, and so is health care. Technologies and processes that reduce or remove those impediments are generally considered progress. This month, we're looking at progressive solutions for some of health care's vexing problems. 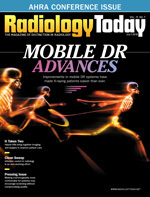 Our cover story highlights improvements in mobile DR systems that are allowing radiography to be performed in more places than ever. As several sources told Keith Loria, efficient workflow demands flexibility. Older generations of mobile DR machines were bulkier, had less battery power, and sometimes had connectivity issues. Newer models are allowing hospitals to use mobile DR as a reliable point-of-care device, simplifying workflow and improving the health care experience for patients who are difficult to move. Reducing patient movement also figures prominently in Jeannette Sabatini's feature on hybrid operating rooms. The ability to image patients during surgery without moving them improves patient care, saves time, and fosters collaboration between interventional radiologists and surgeons. The people who were interviewed were more than willing to share their expertise in developing and implementing these rooms. With the increased focus on patient preferences, companies that produce mammography systems are turning their attention to improving the mammography experience. Too many women still avoid breast cancer screening because of concerns about pain, even though mammography has been proven to improve patient outcomes and save lives. Beth W. Orenstein provides a round-up of the latest equipment features and how they're helping to reduce discomfort without compromising image quality. Another patient-centric issue that radiology—and every other department—needs to be mindful of is health care–associated infection (HAI). Despite the publicity that HAI has received over the past several years, it's still a significant problem. Dan Harvey speaks with some experts who offer their views on radiology-specific HAI challenges as well as some general thoughts about how to assess HAI risk and put a risk mitigation plan into action. Finally, we thought you might appreciate a lighter look at the world of radiology, so we decided to include a cartoon within these pages. Cartoonist Jerry King is providing the entertainment, with some inspiration from Radiology Today's very own Kevin O'Brien. Welcome aboard, Jerry!